the Newton's Nook Designs blog! This Biweekly Challenge was a SKETCH challenge! 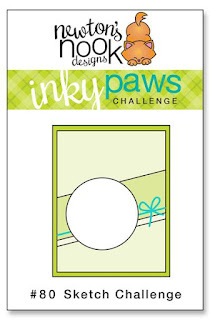 Inky Paws Challenge #80 Winner! Janice creates this stellar card by using fun, playful stickers with a "space-like" theme. 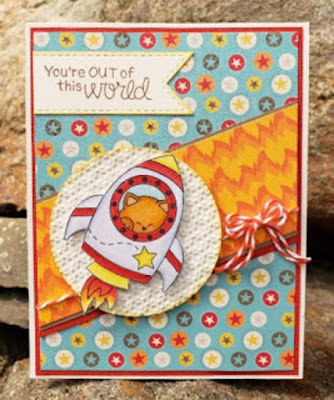 She then uses the rocket image from the Cosmic Newton stamp set and adds a banner with her sentiment. This bright, colorful card is sure to be a hit! 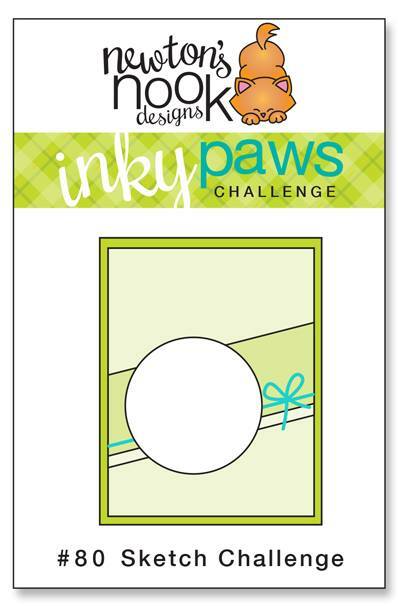 Dawn designs this sweet card with her creative interpretation of the sketch. 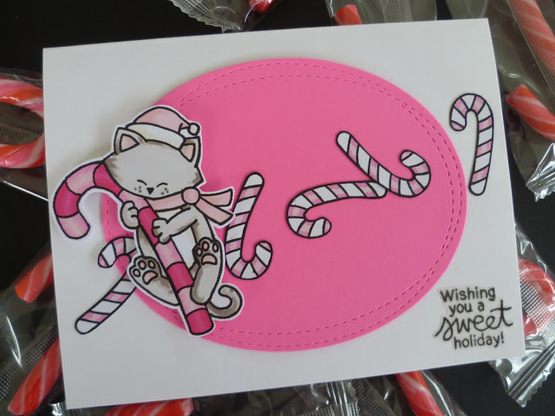 She die cuts her pink oval and then uses candy canes dancing across her card for her stripe. Her finishing touch is her softly colored kitty sliding down the giant candy cane from the Newton's Candy Cane stamp set. Sweet! Janice creates this beautiful autumn card by mixing several fall-themed pattern papers. She then colors all those leaves from Autumn Newton stamp set. Her final touch is that orange jute bow. 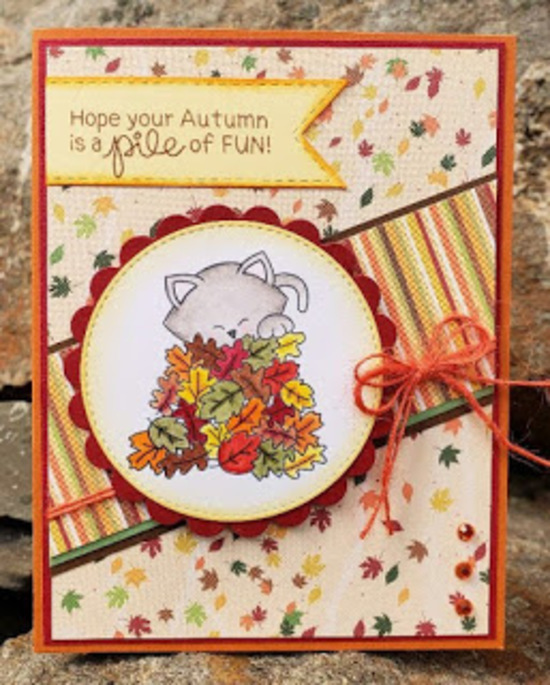 Such a fun fall card! 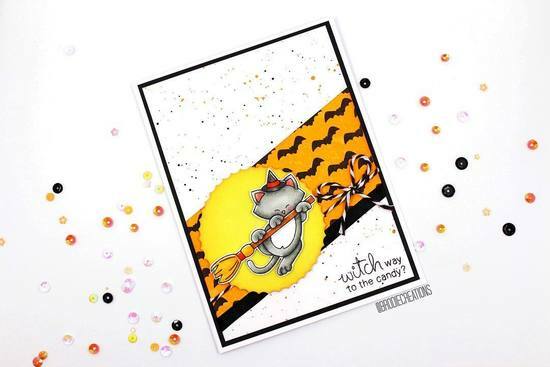 Heidi's use of the purple foil and the Flying Bat stencil makes her stripe spook-tacular! For her background, she repeatedly stamps the candy images from the Hoppy Halloween stamp set in purple. For the main attraction, she uses this darling bunny (also from Hoppy Halloween). What a wonderful Halloween card! Brodie brings us this delightful Halloween card. She creates a speckled background then creates her stripe using the Flying Bats stencil and a strip of black paper. She then adds her wonderfully colored kitty from Newton's Boo-tiful Night stamp set and adds her sentiment. Such a fun card! 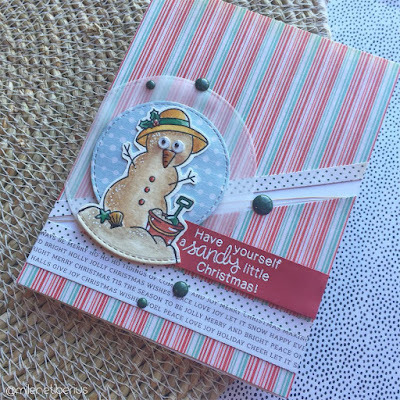 Those googly eyes on Milene's sandman from the Sun Soaked Christmas stamp set would make anyone smile! Her fabulous coloring and soft pastel striped background makes this such a fun, festive holiday card! WoW! What a great way to start the week! Thanks so much for the win and the DT pick.